The Federal Department of Transportation requires that most commercial drivers receive a medical exam before obtaining or renewing their license. This is required on an ongoing basis, at least every two years and must be performed by a “licensed medical examiner”. 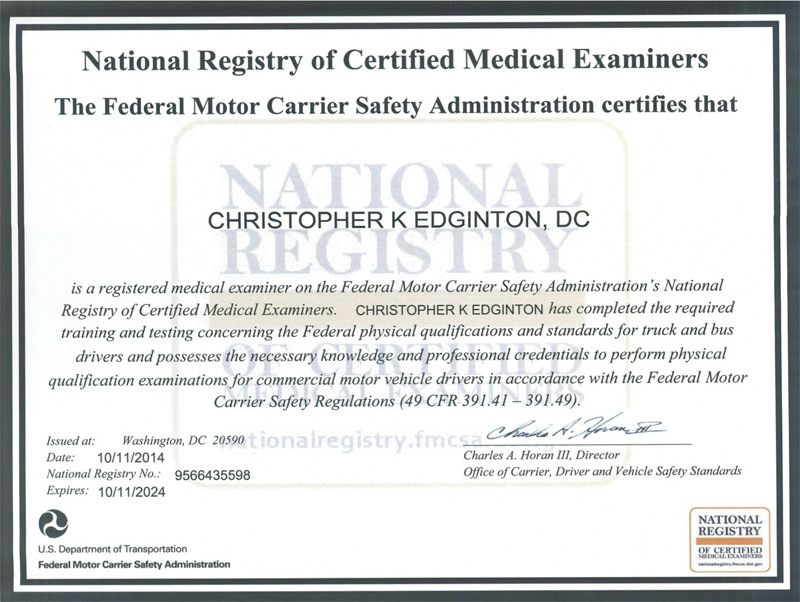 Dr. Chris Edginton is listed on The National Registry of Certified Medical Examiners and is trained and certified to perform these exams on commercial motor vehicle (CMV) operators. The exam involves a detailed medical history and physical exam and at the American Back Center, appointments are often available the day of. We strive to make the process quick and efficient, all in a low-key, welcoming environment.